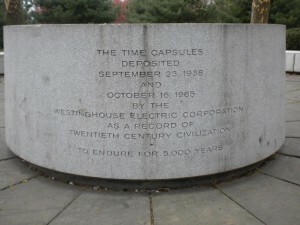 Two Shots of the Time Capsule Marker as taken 24 April 2015. 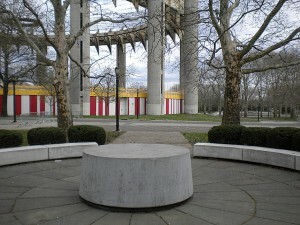 A close-up of the inscription in one, and in the other, a reverse angle, looking toward the derelict remains of the 1964-1965 New York State Pavilion. There are two Time Capsules buried on the site. The first, buried in 1938, is fifty feet directly under the center of the marker. The second, buried in 1965, is exactly ten feet due north of the first, and is likewise fifty feet down. It is therefore just about six or seven feet out from under the marker, roughly on a line with the gap seen in the bench-wall on the left side of the second photo. There’s a very busy road about 150 yards behind the marker, (to the photographer’s rear in the second shot) just close enough for the noise to be there, but in the background. Somehow, the rush and hum of traffic just beyond makes the emptiness of the spot seem that much emptier. This spot was thronged by millions in the years 1939-40 and 1964-65. Today, it is quiet, calm, and a little desolate. Plans call for the Time Capsules to be unearthed in 6939 AD.